How do we use the questionnaires? How can we get the most value from our assessments? What is the Quality Mark? What is the Diversity Excellence Standard? How do we create and export reports? How extensive are the system resources? How will the system be developed further? Impact on Every Area - users reported a real impact for every one of the 27 criteria assessed. Including increased organisational impact, better governance, more effective trustees/management working, increased management team confidence, knowledge & effectiveness, and improved overall leadership & management. 'All I can say is "What's not to like?!" Within 5 minutes of using the system, I found numerous resources that I was not aware of that our charity can benefit from. Couple this with the simplicity of the format and the focus it provides for each area, it has already become a valuable tool to take our charity forward'. Increasing Your Income - the CEF enables you to assess your income generation and communications processes to identify opportunities to achieve even more and that's not all it does. Donation levels have fallen and 4 in 10 people are donating less, but not when you can show quantifiable positive results. The free Quality Mark demonstrates your commitment to excellence and the assurance table provides data for your funding bids, annual reports, etc, including maximising impact and delivering value for money. Saving You Money - there are links to 200+ organisations that provide free consultancy, advice, professional services, mentoring, training, software/hardware, consumer goods, office/meeting space, fundraising platforms and much more. It also enables you to identify and minimise financial inefficiency, and maximise tax reliefs, including linking you to the guidance you need and people who will help you. Last year, we failed to claim £600m in Gift Aid alone and that's just one of many tax reliefs. "All areas were key to consider and reinforced good practice". Easy to Use and Low Workload - users rated both ease of use and the CEF’s low workload 9/10 and using it saves you time, by enabling you to streamline and manage workload, and remove inefficiencies. There are 3000+ links to free toolkits, templates, policies and other resources to help you. "Simple, easy to answer and understand questions that make you sit up and think!" Getting 'Brexit Ready' - the CEF enables you to assess the potential threats, with links to relevant charity Brexit resources, to help you prepare, and also to download your Brexit action plan. For a short guide, with screenshots, of how it works and how it will help you, click here. Then begin delivering this for your charity by Registering Here. Yes - statements are in plain English, with support for technical terms. It works for any UK non-profit, including Scottish, Northern Irish and UK based international charities and CICs. "This was a great way to think afresh about the important objectives of the organisation and how to measure them". The 8 questionnaires cover your whole organisation and scoring optimises reporting for your priorities, so it focusses on what's important to you. These are strategy, governance, income generation, risk, people, operations, finance & resources and communications. "Very easy to use and navigate, but most importantly I can return at any time to complete". How do I score a questionnaire? Statements are scored using the criteria below. Descriptions of all aspects of performance – the resources available, activities undertaken, what these produce, the outcomes delivered, the impact created, and the overarching management and planning systems. "A really good, quick way to keep us focussed"
How do statements assess critical people factors? The system is able to assess key issues, such as leadership, culture and decision making, by taking into account not only what is done, but who does it, how well, their capacity and expertise, and how motivated they are in doing so. How many statements are in each questionnaire? Usually between 20 and 50, depending on the questionnaire, and your charity’s size, sector, where it operates and the activities it undertakes. Your results are very simple to understand and use – these are displayed using 3 top-level dials and analysed in the tables below. Results are colour coded, so you can see at a glance where there is most scope to achieve more. It’s no more than 2 clicks to all functionality. "The most concise yet simplistic Business Intelligence dashboard for Board and Charity leaders. Indispensable!" What do the 3 tables assess? The Core Functions and Governance tables reflect your 8 questionnaires. 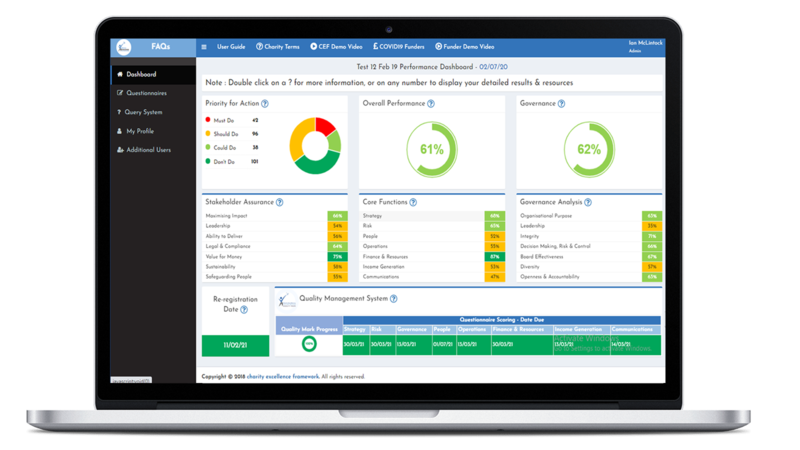 The Performance Analysis table assesses performance from across your organisation, as follows: Charitable Impact, Leadership, Realism & Capability, Legal & Compliance, Resource Efficiency (achieving value for money), Sustainability and Duty of Care (keeping people safe from harm). What is the Quality Management Table? HOW CAN WE GET THE MOST FROM OUR ASSESSMENTS? Performance is assessed in a variety of ways, to enable you to decide which you would gain most benefit from focussing on. For example, an organisation facing financial challenges might prioritise Sustainability and Income Generation, whereas an organisation working in a highly regulated sector may focus more on Legal & Compliance and Risk. "The system was entirely thought provoking and gave greater insight of the areas which will require further focus by us". Your scores are based on your assessment of how well you are performing and how important this is to you. The CEF optimises these to focus on what’s most important to you. .
What do the Must Do, Should Do, Could Do, Don’t Do categories mean? Demonstrable evidence to funders and other stakeholders of your commitment to excellence. Once qualified, you'll be sent the logo to use. How does it compare to other Quality Marks? It's free, with no additional workload, you're assessed using a framework created to meet your specific needs, not the normal one size fits all, and the assessment is ongoing, not once every few years. If you're paying for yours - why? To find out more Click here. In a sector blighted by scandals it demonstrates to everyone your commitment to excellence in all areas, including maximising impact, delivering value-for-money and keeping everyone safe, provides assurance to trustees and recognition to your staff and volunteers for achieving this. "We are really pleased to have achieved this quality mark and thank you for the ease of which we were able to assess our effectiveness including our policies, processes and procedures that we have in place for all to work within, safely. The framework clarified our achievements and made them quantifiable, but also helped to highlight where we want to improve further". What evidence will stakeholders and funders have of this? When you qualify, the logo is automatically displayed on your dashboard and reports. You may also use it in your own marketing materials, as long as you continue to meet the quality standard. “I’m delighted that we’ve gained the Quality Mark. It provides a structured but easily accessible way to review operations, locate gaps in operational excellence and, most importantly, be the best we can be for those that we support”. The Diversity Excellence Standard uses more than 2 dozen metrics to test diversity, from culture, to procedures, targets and outcomes, and at all levels. It provides recognition for the many non-profits who have already achieved and benefit from being diverse, tools and resources for those who wish to be and a measurable framework to hold accountable those who don't. 'In our experience, to date only one organisation has ever commented upon the diversity of our Trustee Board / Personnel, and stated that we are diversity personified’. The CEF automatically assesses against the standard, but it can also be used offline. Were it to be adopted by public sector and charitable funders, it would rapidly improve diversity across the sector. The diversity result is displayed on the dashboard and clicking on the score displays the underpinning metrics and their scores. The assessment is complete, once all 8 questionnaires have been scored. Partially Achieved - an overall score coded green (50%+), with no underpinning red scores (25% or less) and an action plan being implemented that will turn any amber scores to green, within a reasonable timescale. Fully Achieved - an overall score of green, with no amber of red scores. HOW DOES THE QUERY SYSTEM WORK? You can carry out in-depth analysis by clicking to select from nearly 100 criteria. You can very quickly and easily generate action plans for meetings or planning, investigate opportunities or issues, carry out routine management checks or respond to queries from the Board or others. "Working through each section provided a great opportunity to think through what we have done and what extra we could do and, with the resources there, made this process really worthwhile". Click the Export button, to download any detailed report, or query results in action plan format, in Excel. "Clear and logical approach that focuses us on what we are doing well and what we need to improve. The links to source material are great". “The links to source material are great”. There are 3000+ links to resources produced by 100+ organisations, which are being continually updated, plus downloadable toolkits, guides and templates. The system finds what you need for you, so you don't have to. "The resources and additional links are very helpful". The aim is to transfer ownership to partners to scale the system to very large numbers to have real impact. Phase 2, the Charity Sector Data Store launched in Aug 18. It is intended to be used by the sector to enable us to act strategically to identify and resolve issues, before we read about them in the Media. Over 4 years, 1000 organisations would generate 3.5 million pieces of data, which can be analysed in-depth and in real-time, using 100+ criteria. There are 2 further phases. Planning is well advanced and development will be low cost, as this was designed in from the outset. Phase 3 - promoting transparency and accountability, by linking online stakeholder questionnaires directly to the core system to create digital shareholders. Phase 4 - developing and recognising professional skills, by using the system structure, content and resources to create a low-cost online qualification, with an associated Fit-to-Practice accreditation for CEOs and those aspiring to the role. Your data will not be disclosed to a third party without either your consent, or unless required to do so by law. Full details are in the Privacy Statement and Terms & Conditions, available via the website links.